IT’S TIME TO TAKE BACK THE SECOND! 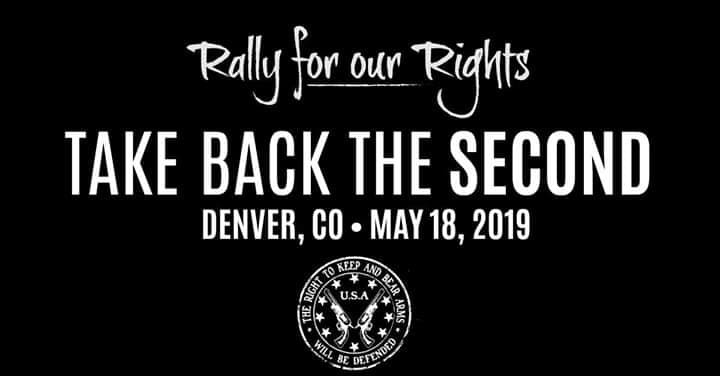 Join with your fellow Second Amendment supporters at Rally for our Rights : Take Back The Second – a demonstration in support of the Right to Keep and Bear Arms! With the passage of Colorado’s HB19-1177 “Red Flag” ERPO gun confiscation bill, people are angry – and they should be! This unconstitutional and downright dangerous piece of legislation was opposed by citizens and law enforcement alike. Nearly every sheriff in Colorado has come out in opposition to the bill as written – the form in which it was passed – as did the Denver Police Union and Aurora Police Union. But the privileged politicians under the Golden Dome forced through the bill knowing THEY will never have to enforce it! They do not care about law enforcement or gun owners lives, they only care about their agenda of taking away guns from those who have never committed a crime. They only care about their end goal of disarming citizens. “Red Flag” ERPO was passed alongside many other outrageous, non-firearms related pieces of legislation, and we understand people across this state are furious over many things. All are welcome at this event, but do know the focus is on gun rights. As with all Rally for our Rights events, this is a non-partisan rally, and we ask those in attendance to keep their partisan politics at home and stand shoulder to shoulder with their fellow citizens who are just as angry as they are – no matter their party affiliation. New laws coming out of the 2019 Colorado Legislation Session have created many unique bedfellows. We have Libertarians and Law Enforcement standing together against “Red Flag”, we have Democrats and Republicans standing arm in arm over “Oil & Gas”, and we have Unaffiliateds rising up with all the parties against “National Popular Vote”. It is NOT left vs right, it IS the citizens vs the elites. It is US vs THEM. More to be announced soon! Stay tuned! Sponsorships are available on two levels: Basic $25 or Booth $100. Click here to learn more about sponsorship opportunities and secure yours. All funds from sponsorships directly help to fund this event.